In today’s polarizing political climate, every statement and action has an intense forbearance on the course of dialogue. Boston University’s College of Fine Arts took a step towards engaging in this debate by showcasing several impactful plays in their “Quarter Zero” series over the weekend. The series included three productions. The first was “Dutchman,”a production set in a New York City subway car that examines race, class and gender, written by LeRoi Jones and directed by Desiré Hinkson. “Speech and Debate,” a dark comedy that explores identity, sexuality and belonging through the lens of high school students, written by Stephen Karam and directed by Chase Schalchlin. 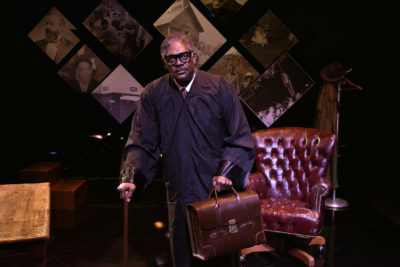 The final play was “Thurgood,” a one-man play presented by the New Repertory Theatre that depicts the life of Thurgood Marshall, the first African-American Supreme Court justice, and the impact his work has made. Director Benny Sato Ambush and featured actor Johnny Lee Davenport brought the character of Marshall to life in a live performance. Davenport explained how he was especially excited to come to Boston University on that day because it was the first week for the incoming freshmen. The story moves through the several different phases of Marshall’s life and managed to do full justice to each of them. The production began from his youth, then followed the timeline of his career as a lawyer. As one of the central figures in the civil rights movement, Marshall’s life made a rich story with many lessons for audience members to take from it. Davenport elaborated on how the play initially made its Broadway debut in 2008 and was written by George Stevens Jr., founder of the American Film Institute and writer, director and producer. Initially, the production didn’t receive much attention but the idea was revisited by Davenport and his team because they believed its content could create an impact within a short amount of time. Ambush, the director of “Thurgood,” said he and Davenport discussed the importance of performing this play at this specific point in time, in relation to the 2016 presidential election. They wanted to continue the tour of “Thurgood” because they believed that Marshall’s messages are especially needed right now, especially with the political, social and economic state of the country. The attendees seemed to engage with this viewpoint as they participated in the question-and-answer session that immediately followed the performance. Several topics were discussed ranging from artistic concepts and the work that went into a one-man show. In addition to this, there were other conversations about political and moral issues such as the extent to which defending one’s community and race was a viable idea. Julian Manjerico, a freshman in CFA, explained how the play made him feel as an acting student.